(AFP) - British ministers met on Tuesday to intensify plans for leaving the European Union without a deal -- a prospect that is becoming more likely as Prime Minister Theresa May plays for time with just 101 days to go until Brexit. The opposition Labour Party meanwhile faced refusal over its request for a no-confidence motion in May and growing pressure to table a binding vote against the government. May on Monday said the government was preparing for a no-deal Brexit and "the cabinet will be discussing the next phase in ensuring we are ready for that scenario". She will be refereeing between ministers who want the government to step up preparations for a no-deal scenario and those that want parliament to have a final say in a series of votes on potential options for Brexit. Opposition leader Jeremy Corbyn on Monday tabled a non-binding no-confidence vote in May after she told MPs they will get another chance to vote on her deal in the week beginning January 14. "This house has no confidence in the prime minister due to her failure to allow the House of Commons to have a meaningful vote," Corbyn told lawmakers ahead of tabling the motion in parliament. But Downing Street was reported on Tuesday to be blocking the motion from being debated. "We won't allow time for what is a stunt," Britain's Press Association quoted Downing Street as saying. Labour had the option of tabling a binding motion but faced defeat after Conservative Brexit hardliners and the Democratic Unionist Party, which props up her government, both said they would back May. Leading eurosceptic Tory MP Jacob Rees-Mogg told BBC Radio 4's Today programme on Tuesday that he "will always support the Conservative government, I will not vote a Conservative government out of office." Rees-Mogg led a party confidence vote against May last week, which she survived, but only after a third of her parliamentary party voted to oust her. 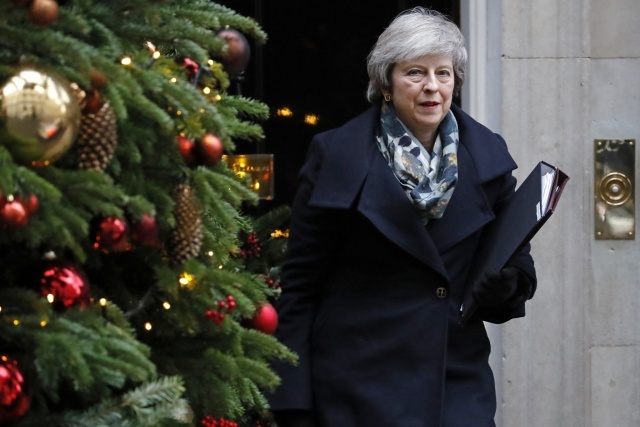 Even a non-binding vote of no-confidence from a majority in the House of Commons could leave May's authority further weakened -- and potentially prompt another vote in her entire government and a general election. Britain is set to leave the European Union on March 29 next year, but after 18 months of tortuous negotiations appears no closer to formalising a divorce deal. If parliament fails to approve the text of her deal, Britain could crash out of the EU with no deal -- a prospect that experts warn could lead to serious trade disruption and trigger a financial crisis. May insisted Monday that she was continuing to seek "assurances" from the EU over elements of her plan, although EU officials said no meetings were planned. The delay on the vote has angered members of her own party and Labour opposition politicians, who accused her of trying to "run down the clock" ahead of Britain's withdrawal to increase pressure on them to back the deal. "The prime minister has cynically run down the clock, trying to manoeuvre parliament into a choice between two unacceptable outcomes" -- her deal or no deal, Corbyn said. May is also facing calls for a second referendum to resolve the impasse, with dozens of MPs from all sides now supporting another poll and reports that May's officials are considering the possibility. "Let us not break faith with the British people by trying to stage another referendum," she told parliament on Monday. "Another vote... would do irreparable damage to the integrity of our politics," May said, adding that a second vote "would likely leave us no further forward".